The Barvalipe Academy is the agenda-setting and strategic body of the Institute which has an advisory and inspirational role, in order to fulfill ERIAC’s objectives. Barvalipe is composed of 15 members – highly regarded, publicly acknowledged individuals, with competencies in the areas covered by ERIAC activities. Two thirds of the Academy members must openly declare their Romani ethnicity, respecting the diversity among the Romani communities. Gender balance must be ensured. The first 7 members of the Barvalipe Academy will be nominated by ERIAC’s Board “Pakiv”. The remaining 8 members of the Baravlipe Academy will be elected by the members through the thematic sections. Each section will delegate two representatives to Barvalipe. 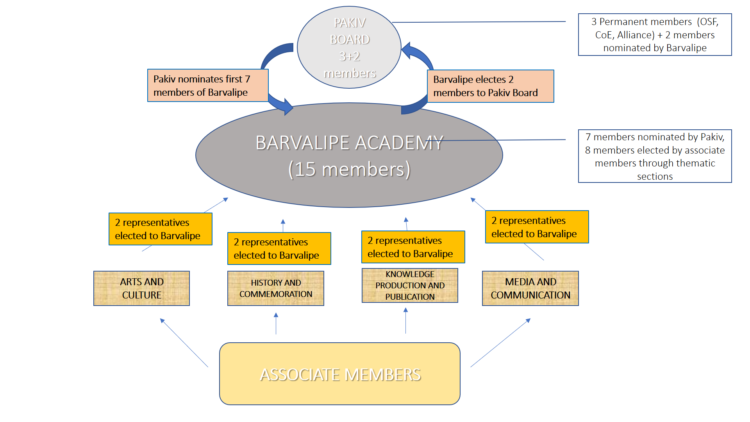 Two members of Barvalipe Academy, elected internally, are delegated to the “Pakiv” Board and become a bridge which connects the ERIAC’s associate membership with the Board. Jarmila Balazova (1972, Brno) is a Czech journalist, moderator and Roma activist. In 1997 she graduated from the Faculty of Social Sciences of Charles University in journalism. Between 1992-1998 she worked at the Czech Radio in the Roma editorial office, where she prepared the Roma broadcast „O Roma vakeren”. Since 1997 she has been the Editor-in-Chief of the Romani monthly „Amaro gendalos”. Since 1999 she has been working on Czech Television on a dramaturgy of programs for children and youth and has been the host of the children’s discussion program called “Tykadlo” and a talk show by Jarmila Balážová. On TV Nova presented agenda “Áčko”. From the years 2003-2014 she was editor-in-chief of the monthly „Romano voďi”. Between 2002 and 2013, she worked with Czech Radio 6 where she prepared and featured programs Human Rights Focus, Studio STOP, Interview, Focus on Young and Sciences Speech. Until 2014 she acted as chairwoman of the board of directors of ROMEA. Since 2014, she has been working as Press Secretary for Human Rights Minister Jiří Dienstbier, since November 2015, she has been in the same position at the Ministry of Education. Dr. Maria Bogdan received her PhD from the Film, Media and Culture Theory Doctoral Program at the Eötvös Loránd University in Budapest in 2018. She wrote her thesis about the media representation of the Roma in Hungary, and developed a multidisciplinary theoretical approach based on cultural studies for analyzing and understanding the position of Roma in the Hungarian society. Her main research interest is related to media representation, the modern forms of racism, and the questions of diversity. She has published numerous articles in English and in Hungarian related to these topics in international and Hungarian journals. Dr. Bogdan was a visiting researcher at CEU Romani Studies Program in 2018, and prior to that position, she was a researcher at the Hungarian Academy of Sciences (2014-2017) and an assistant lecturer at the University of Pécs (2006-2013). She is also a Fulbright Alumna and completed part of her PhD research at Columbia University in New York. She has also studied journalism and film and has worked as a journalist at different media organizations in Hungary. Dr. Bogdan is one of the founding editors of Critical Romani Studies journal and is a member of the ERCF Board which runs Gallery8 – the first Roma contemporary art space in Hungary. Professor Dr. Ethel Brooks is an Associate Professor in the Departments of Women’s and Gender Studies and Sociology at Rutgers University, New Jersey. She has conducted research on an host of sites around the world including London, Istanbul, Fall River, San Salvador, Dhaka and York City. Professor Brooks is currently working on two book projects: “Disrupting the Nation: Land Tenure, Productivity and the Possibilities of a Romani Post-Coloniality”, and “(Mis)Recognitions and (Un)Acknowledgements: Visualities, Productivities and the Contours of Romani Feminism”, both of which focus on political economy and cultural production and the increasing violence against Romani (Gypsy) citizens worldwide. In 2011 Professor Brooks was awarded a prestigious Fulbright-University of the Arts London Distinguished Chair Award and she spent the academic year 2011/2012 at TrAIN – the Research Centre for Transnational Art, Identity and Nation. Part of the award supported Professor Brooks’ delivery of a lecture series in conjunction with the Tate Gallery, London. Brooks serves as a member of numerous boards and commissions, including the USC Shoah Foundation VHA External Advisory Committee, the RomArchive, the European Roma Rights Centre, and the Rutgers Center for Historical Analysis. She is a member of the US Delegation to the International Holocaust Remembrance Alliance and its Roma Genocide Working Group. In 2016, she was appointed by President Obama to the U.S. Holocaust Memorial Council. Dr. Ismael Cortés-Gómez is a political philosopher who currently holds a double academic position as a part-time lecturer at the Unesco Chair of Philosophy (Universitat Jaume I de Castelló) and as a visiting researcher at the Institute DEMOS Paz (Universidad Autónoma de Madrid). Last year he was awarded a postdoctoral position at the Romani Studies Program (Central European University). His research interest focuses on the interrelation among law-culture-politics, by analyzing how ideologies constitute institutional norms, policy frames, and action programs. During his academic career, Dr. Cortés-Gómezhas been a researcher at the School of Critical Theory & Cultural Studies (University of Nottingham), the Institute for the Study of Peace and Conflicts (International University of Andalusia) and the Institute of Human Rights Bartolomé de las Casas (Universidad Carlos III de Madrid). Dr. Cortés-Gómez has worked as a policy analyst for Open Society Foundations from 2016 to 2018, both with the Budapest and the Brussels office; he also collaborates as an associate researcher with the Brussels-based think tank Centre for European Policy Studies. He has published numerous papers in peer-reviewed journals and op-eds with newspapers such as HuffPost, Le Monde Diplomatique, Euractiv, and El País. His work is deeply engaged with the criticism of new forms of racism and ethnonationalism in the European Union. Mihaela Drăgan is an actress and playwright working in Bucharest and Berlin. In 2014, she co-founded Giuvlipen in Bucharest – “a revolutionary theater”, according to Reuters news agency, and a cultural phenomenon on the local scene. Giuvlipen performances have a feminist and anti-racist focus, aimed at promoting critical discourse in modern society. In 2018, Giuvlipen was present in six national and international theater festivals, with the tour “Romanian Theater is not a Nomad!” marking a record achievement for Roma theater in Romania. In 2017, Mihaela Drăgan was nominated for the Gilder / Coigney International Theater Prize in New York, which recognizes the outstanding work of 20 artists around the world. Mihaela was one of the six finalists and the youngest artist nominated for this award. A year later, her work as a playwright received recognition, when she represented Romania again in New York, at PEN World Voices 2018 International Festival, as one of the ten most respected contemporary playwrights of the world. Also in 2018, she had an art residency at ParaSite Hong Kong, where she set up a new artistic movement – Rome Futurism, which explores science fiction elements in Roma culture, thus intersecting Roma culture and history with the advanced technology of the future. In 2019, she will be part of the International Residency for Emerging Playwrights residency program, 2019 Focus Europe, at the prestigious Royal Court Theater in London. Over the years, Mihaela has also worked as a Trainer for the Oppressed Theater in marginalized Roma communities in Romania and held various talks on Roma rights at events such as TEDxEroilor and Creative Mornings. Tony Gatlif is an acclaimed French film director, screenwriter, composer, actor, and producer of Romani ethnicity. He was born in Algeria in 1948 and came to France in 1960. Starting in 1981, he has tackled the theme he now explores from film to film: Romani people from all over the world, seduced by this “community in movement” and “of great richness and diversity.” He is best known for his films dealing inspired by Romani arts and culture, including “Latcho Drom” (1993), “Gadjo Dilo” (1997), “Vengo” (2000), “Transylvania” (2006) and “Korkoro” (2009). His 2004 film “Exils” won the Best Director Award at the 2004 Cannes Film Festival. He was made a Chevalier de la Légion d’Honneur on 30 March 2015. Dr. Delia Mandalina Grigore is a Rromani woman born 1972 in Galaţi, Romania. She holds a Ph.D. in visual arts, with a specialization ethnography-ethnology from the Romanian Academy, Institute of Ethnography and Folklore in 2004. She is a senior reader at the University of Bucharest, Faculty of Foreign Languages and Literatures, Rromani Language and Literature Section and the President of the Roma Center “Amare Rromentza”. She works in education, Rromology research (e.g. ethnography, ethnology, ethnolinguistics, folklore, oral history, and literature) and Rromani culture fields. She is the author of several works, including Introduction in the Study of Traditional Culture Elements of the Contemporary Rromani Identity (2001, University of Bucharest – CREDIS, Bucharest) and Rromanipen – Keystones of Rromani Culture (2011, Amare Rromentza, Bucharest). She is a team member for the presentation of Rromani Literature in Romania for RomArchive. Delaine Le Bas was born in 1965 in Worthing, U.K. She studied at St Martins School of Art London. Delaine is a cross-disciplinary artist creating installations, performances, photography, and films. She was one of sixteen artists who were part of “Paradise Lost,” the first Roma Pavilion of the Venice Biennale 2007. She worked with her late husband, artist Damian Le Bas, on their installations for their ongoing projects “Safe European Home?” and projects “Gypsy Revolution” and “Gypsy DaDa”, and in 2017 to produce the stage artworks and costumes together for the “Roma Armee”. Delaine created the “Romani Embassy” in 2015. She also has created performance text works with her son, writer Damian James Le Bas. Her works have been included in the Venice Biennales of 2007 & 2017, the Prague Biennales of 2005 & 2007, the Gwangju Biennale 2012, the Zacheta National Gallery of Art 2013, the MWW Wroclaw Contemporary Art Museum 2014, the Third Edition of the Project Biennial of Contemporary Art D-O Ark Underground Bosnia and Herzegovina 2015, the Off Biennale Budapest 2015, the Goteborg International Biennial for Contemporary Art Extended 2015, and the Critical Contemplations Tate Modern 2017. Delaine is one of the curators for 1st Roma Biennale 2018 and is an Associate Curator at 198 Contemporary Arts & Learning London U.K.
Emília Rigová (born 1980) is a visual artist from the Slovak Republic. She is laureate of the Oskar Cepan Award (2018) for young artists under 40 in Slovakia and a laureate of the Roma Spirit Award (2018). In addition to her artwork, she teaches art courses (object, multi-media, inter-media) at Matej Bel University in Banská Bystrica. For Rigová, an object in the form of installation or as a performance or a site-specific intervention is a basic element of her art language. Further, she expresses herself through the 2D interface of computer graphics, with reference to classical painting. Concerning the content of her work, she explores intersubjective emotion modified by a specific social-cultural environment. The last five years, her work deals with the topic of internal and external construction of Romani identity and the appropriation of the Romani body in the long history of European culture. Romani Rose (born 1946 at Heidelberg, Germany) is a Romani activist who lost 13 relatives in the Holocaust of the Nazi purges against the Romani people and Jews and is the head of the Central Council of German Sinti and Roma. During the founding of the Central Council in 1982 he was voted to the position of Chairman by the delegates of the member organisations – then 9, now 16 state and regional associations – and since then has been confirmed in his post every four years at the member meetings. From 1991, Rose took over the management of the Documentation and Culture Centre of German Sinti and Roma in Heidelberg. For years he has been known by the federal and state governments for his resoluteness and for his persistent and unyielding work. Together with the Chairpersons of the National Minorities in Germany, Rose leads the Minority Council, which was founded on September 9, 2004. It is the union of the umbrella organisations of the four national minorities which belong to the German nation and have always been resident and autochthonous here. For three decades –since June 1979 to be exact – he has led the work for the civil rights of German Sinti and Roma before the eyes of the German as well as the international public; he has also fought for their protection from racism and discrimination, for compensation for the survivors of the Holocaust – at the same time announcing the magnitude and the historical importance of the genocide of 500,000 Sinti and Roma in National Socialist occupied Europe. In May 1995, in cooperation with the member organisations of the Central Council, Rose achieved recognition for German Sinti and Roma as a national minority in Germany with their own minority language, connected with their goal of equal participation in social and political life. Mihaela Zatreanu is probably one of the best Romani language teaching experts among the Roma with a broad outlook at the Romani language field. A graduate of the Pedagogical High School and Foreign Language Faculty in Bucharest, Mihaela has worked in Roma education for the past 15 years, first as a primary school teacher, then as a trainer for Roma and non-Roma educators, and educational inspector at the Ministry of Education. Mihaela Zatreanu has been developing the first curriculum for Romani language in Romania and continued her activity authoring of textbooks, publishing a series of textbooks for Romani language. During 5 years as an educational inspector in the Ministry of Education and Research, she contributed to the designing of the legislative policies for increasing the school participation of Roma, has been monitoring and guiding local programs for supplementary school assistance, and introduced the school mediator for the first time in Romania. Mihaela Zatreanu had an important role in introducing Romani language and history in state schools at national level and for the allocation of special places for Roma students at high school and university level. At the European level Mihaela Zatreanu has been working in cooperation with the Council of Europe as a Chief Executive Officer at the European Roma and Travellers Forum. She was acting several years as the educational expert for the Council of Europe, contributing to the development of the policy paper for the education of Roma children in Europe, developing the Guide for Roma school mediators, teaching materials for preschool education and the Curriculum Framework for Romania Language together with a group of European experts. She has been CoE trainer for school mediation and the National Program Officer of ROMACT program in Romania. Croatian Romani Union, “KALI SARA” (cro., Savez Roma u Republici Hrvatskoj “KALI SARA”) continues the long tradition of the Association for Promoting Roma Education in the Republic of Croatia (UZOR). “KALI SARA” founded in 2007 by MP Mr. Veljko Kajtazi, is one of the most active Roma organizations operating in the Republic of Croatia. It gathers the highest number of Roma community members, associations of the Roma national minority, and the democratically elected Councils of the Roma national minority at the level of counties, cities and municipalities. Today, CRU “KALI SARA” is the main partner of the Government of the Republic of Croatia in implementing the National Roma Inclusion Strategy (2013- 2020), the Operative Plan for National Minorities of the Government of the Republic of Croatia (2017- 2020) and various other programs and initiatives that aim for the improvement of the position of the Roma in Croatia. They are particularly proud about their newspaper, published in four languages (Phralipen.hr), the ongoing initiative of building the Memorial Centre Uštica, and their modern headquarters in the Zagreb City centre. The Museum of Roma Culture in Brno was established in 1991, their first permanent exhibit was opened on 01 December 2005. The Museum also offers a space for research and community gatherings. The MRC holds a unique position in the world, due to its long existence and collection and documentation work and is a strong partner of ERIAC. Owing to the experience and the team of experts available at the Museum, a cooperation between the MRC and ERIAC will be beneficial and enriching.